Is The Department Of Justice Just? Judicial Watch released 294 pages of FBI “302” documents revealing top Washington IRS officials, including Lois Lerner and Holly Paz, knew the agency was specifically targeting “Tea Party” and other conservative organizations two full years before disclosing it to Congress and the public. An FBI 302 document contains detailed narratives of FBI agent investigations. The Obama Justice Department and FBI investigations into the Obama IRS scandal resulted in no criminal charges. The Internal Revenue Service (IRS) clearly violated the free speech rights of American citizens because the Obama Administration wanted to silence their views. This is a serious affront to our representative republic and should not go unpunished. Attempting to use the IRS for political purposes was one of the items of impeachment drawn up against President Richard Nixon. Has the Justice Department forgotten what the law is? If so, it is time for a new Justice Department. Fox News is reporting today that Judge Reggie B. Walton of the U.S. District Court for the District of Columbia has ruled that the Internal Revenue Service (IRS) must provide the names of specific employees involved in targeting Tea Party groups. The Judge has also ruled that IRS the must provide information about which groups were targeted and why, along with a strategy to make sure such targeting doesn’t happen again. This is one of the few common sense rulings in this case. This might also be the pathway to having employees of the IRS reveal who ordered the targeting. The targeting scandal drew much attention in 2013 when the IRS, headed at the time by Lois Lerner, admitted it was applying extra scrutiny to conservative groups applying for nonprofit status. This is the equivalent of apologizing for robbing a bank, refusing to give back the money, and not going to jail. The apology is worth nothing. Walton ordered the IRS to search for further records, according to The Washington Times, in other agency databases for the time period spanning 2009 to March 27, 2015. “Furthermore, to the extent that the plaintiffs have already received information produced by the government indicating that the plaintiffs were allegedly discriminated against, and that information provides a basis to believe that other such documents exist, the government must search all relevant sources to ensure that all documents responsive to the document request is identified and produced,” the judge wrote in his order. Walton gave the IRS until Oct. 16 to finish the search. This is a serious move toward draining the swamp. This isn’t a surprise, but it is extremely disappointing. The Daily Caller is reporting today that the Justice Department will not file criminal charges against Lois Lerner. Ms. Lerner, as the head of the Internal Revenue Service, routinely discriminated against conservative groups seeking tax exempt status. “Substantial evidence of mismanagement, poor judgment and institutional inertia leading to the belief by many tax-exempt applicants that the IRS targeted them based on their political viewpoints. But poor management is not a crime,” the letter reads, according to CNN. The Justice Department opened its investigation of Lerner, then the director of IRS’ exemptions unit, after it was discovered that she had flagged a disproportionate number of conservative groups’ tax-exempt status applications. Lerner was placed on a leave of absence from the IRS in May 2013 and resigned in September of that year. Just for the record, it wasn’t a belief that conservatives were targeted. The IRS used inappropriate criteria that identified for review Tea Party and other organizations applying for tax-exempt status based upon their names or policy positions instead of indications of potential political campaign intervention. Ineffective management: 1) allowed inappropriate criteria to be developed and stay in place for more than 18 months, 2) resulted in substantial delays in processing certain applications, and 3) allowed unnecessary information requests to be issued. Although the processing of some applications with potential significant political campaign intervention was started soon after receipt, no work was completed on the majority of these applications for 13 months…. For the 296 total political campaign intervention applications [reviewed in the audit] as of December 17, 2012, 108 had been approved, 28 were withdrawn by the applicant, none had been denied, and 160 were open from 206 to 1,138 calendar days (some for more than three years and crossing two election cycles)…. Many organizations received requests for additional information from the IRS that included unnecessary, burdensome questions (e.g., lists of past and future donors). We have reached a very dangerous place in America–where people who disagree with the Democrats in power can be targeted by the Internal Revenue Service. When Richard Nixon, a Republican, attempted that, he was impeached, as he should have been. We have come a long way. Understand that if Hillary Clinton is elected, there will be a new enemies list (the Clintons had one the last time they were in office), and the people on that list can expect to be harassed by the government. Please consider that before you vote. I will admit that I do not love the Internal Revenue Service (IRS). I don’t think that is a particularly unique point of view. My husband and I were audited a few years ago after making a small donation to the Tea Party. Nothing in our returns had changed, and it was the first time we had been audited in forty-seven years. 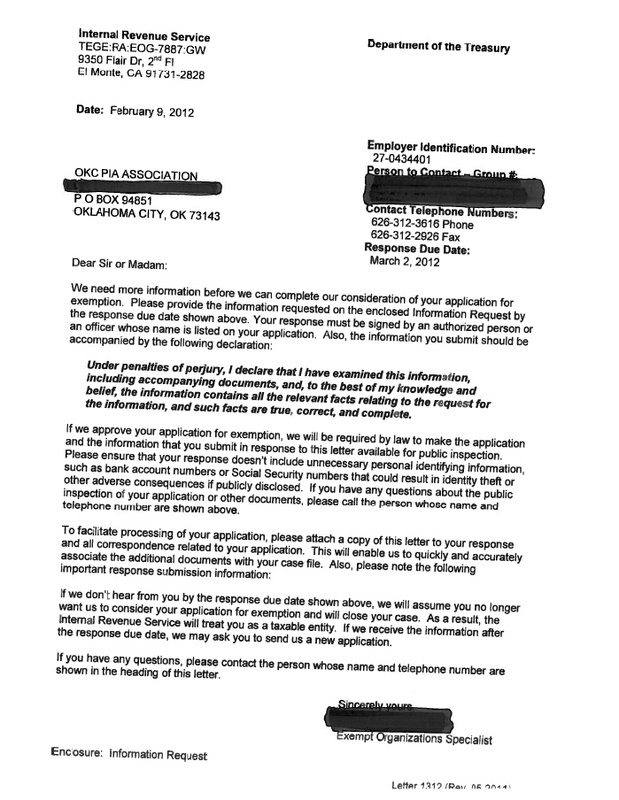 They examined our small amount of paperwork for about a year before they finally told us that nothing was wrong. They are a government agency that has acquired a lot of power over the years, and I believe that in recent years that power has been successfully used against political enemies. Now we are discovering that the IRS was ignoring the rules that were supposed to govern it. Yesterday The Washington Times reported that as a result of a Freedom of Information Act (FOIA) request by Judicial Watch, IRS lawyer Geoffrey J. Klimas has discovered another personal email account used by Lois Lerner for IRS business. Judicial Watch is a non-profit organization that strives to hold our government accountable. Over the years they have been responsible for exposing transparency problems in administrations of both parties. “In addition to emails to or from an email account denominated ‘Lois G. Lerner’ or ‘Lois Home,’ some emails responsive to Judicial Watch’s request may have been sent to or received from a personal email account denominated ‘Toby Miles,'” Mr. Klimas told Judge Emmet G. Sullivan, who is hearing the case. …In the wake of the scandal Ms. Lerner retired from the agency. She declined to testify to Congress, citing her right against self-incrimination, but also said she did not break the law. Americans will only find out what happened at the IRS if a Republican becomes President. I am not convinced any Democratic candidate would be willing to pursue this case. The use of the IRS as a political entity to target conservatives goes against the basic principle of free speech. The lack of prosecution of those guilty of abusing their power in the IRS goes against the American concept of all men being equal under the law. It is time to clean house in this organization. It would be nice to be done with the Internal Revenue Service (IRS) scandal by now, but new things keep showing up. The latest should be a cause for concern to all Americans, regardless of which political party they belong to. Judicial Watch released a report today about its latest findings as a result of its Freedom of Information Act (FOIA) requests filed regarding the IRS. The findings are very unsettling to those of us who believe in free speech. The documents were produced subsequent to court orders in two Judicial Watch Freedom of Information Act (FOIA) lawsuits: Judicial Watch v. Internal Revenue Service (No. 1:14-cv-1956) and Judicial Watch v. Department of Justice (No. 1:14-cv-1239). Why was the IRS coordinating with the Justice Department on Congressional testimony? This sounds like Soviet Russia–not like America. Please follow the link above to Judicial Watch to read the entire article. There is quite a bit there that confirms the much of the Obama Administration was conducting a war on any group that did not agree with them. Why Has It Taken So Long For The Public To Learn This? Fox News is reporting today that the IRS emails that Lois Lerner claimed to have lost may exist on back-up computers. Politico posted a story at the end of July that summarizes the timeline on this whole scandal. Backgrounder recap: It all started in May 2013, when ex-IRS tax-exempt chief Lois Lerner acknowledged the agency inappropriately used loaded key words like “tea party” to scrutinize applicants seeking tax breaks. A critical inspector general report followed, Lerner and others stepped down, and here we are, dozens of congressional hearings later. Although the Justice Department, FBI and Treasury inspector general for tax administration are all probing the matter, it could be awhile before they issue final reports on how and why the ex-IRS official at the heart of the scandal lost two years’ worth of emails, the latest wrinkle in the controversy. 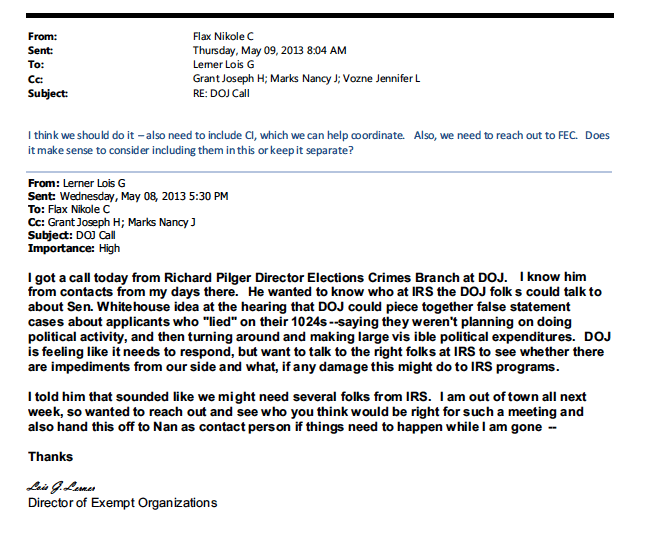 When the Ways and Means Committee began investigating the IRS scandal, they requested Lois Lerner’s emails. In June the Committee was told the emails were missing and that the IRS had been aware of that fact since February. I hate to be cynical (although sometimes it is necessary), but do you think that the IRS and the Justice Department have had enough time to sanitize those emails and delete anything that might be incriminating? I strongly suspect that when the emails are released, there will be nothing even remotely problematic for the IRS. The emails will be strangely innocent. Were it not for the efforts of Judicial Watch using the Freedom of Information Act, the IRS and Justice Department would not even have to take the time to clean up the emails. At least Judicial Watch is forcing the IRS to spend some time covering their tracks. It’s very frustrating to watch the Internal Revenue Service (IRS) avoid producing any information that might shed light on exactly what happened with the tax exempt requests from conservative groups. The dog-age-my-homework excuse is getting rather lame. First Lois Lerner’s emails from the crucial period disappeared, then six of her co-workers’ emails disappeared, and last week it was discovered that some Environmental Protection Agency emails had disappeared. There seems to be a growing black hole for government emails. However, yesterday’s Washington Examiner reported that Judicial Watch is pursuing justice in the IRS case. In its motion, the non-profit watchdog noted that the IRS publicly acknowledged loss of Lerner emails to and from individuals outside of the agency early in February 2014. Then on Feb. 26, the tax agency provided its first production of documents in response to a Judicial Watch Freedom of Information Act lawsuit filed in October 2013. No mention was made in that production of the lost Lerner emails, even though the original Judicial Watch FOIA lawsuit filed in May 2013 specifically sought them. Judicial Watch further noted that “although IRS had knowledge of the missing Lois Lerner emails and of the other IRS officials, it materially omitted any mention of the missing records” in an April 30 status update on its document production. …The tax agency could also face court sanctions or even criminal proceedings if Sullivan is not satisfied with the government’s explanation. I wish Congress had the backbone to hold the IRS accountable, but since they don’t, Judicial Watch will gladly do it for them! Would You Believe This Story Even If You Trusted The Person Who Told It? Yesterday the Daily Caller reported that the Internal Revenue Service (IRS) had cancelled its contract with email-storage contractor Sanosoft just weeks after ex-IRS official Lois Lerner’s computer crashed and shortly before other IRS officials’ computers allegedly crashed (and coincidentally about the time Congress began looking into the IRS’s targeting of conservative groups). Sonasoft’s fiscal year 2011 contract with the IRS ended on August 31, 2011. Eight days later, the IRS officially closed out its relationship with Sonasoft in accordance with the federal government’s contract close-out guidelines, which require agencies to fully audit their contracts and to get back any money that wasn’t used by the contractor. Curiously, the IRS de-allocated 36 cents when it closed out its contract with Sonasoft on September 8, 2011. Lois Lerner’s computer allegedly crashed in June 2011, just ten days after House Ways and Means Committee chairman Rep. Dave Camp first wrote a letter asking if the IRS was engaging in targeting of nonprofit groups. Two months later, Sonasoft’s contract ended and the IRS gave its email-archiving contractor the boot. I suppose there exists a universe in which Lois Lerner’s emails just happened to be unavailable as soon as the Congressional investigators wanted them and the IRS is telling the truth, but I don’t think too many people live there. This is what a cover-up looks like. Congress can either appoint a Special Prosecutor (one who is not connected with or afraid of the current Justice Department) or they can be seen as absolute gutless wonders. I really don’t think there is a third choice. A website called Tpnn posted a story today featuring a picture of the memo sent from Lois Lerner that began the IRS attack on Tea Party Groups. 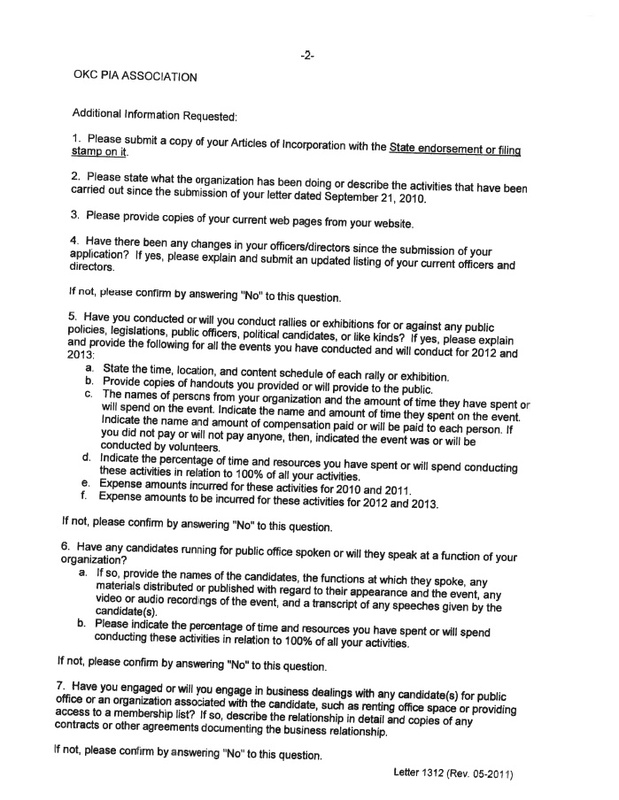 This memo brings the administration into the targeting of Tea Party groups. It will be interesting to see if the mainstream media picks this up. A major news story broke yesterday, and Fox News Special Report was the only evening news show that covered it. In a major new development in the IRS scandal, House Republicans voted on Wednesday to send a criminal referral to the Department of Justice for former IRS chief Lois Lerner. FNC’s Special Report with Bret Baier devoted a full story to the vote by the committee chaired by Congressman Dave Camp, but none of the three broadcast network evening newscasts covered the vote. The letter sent to Attorney General Eric Holder stated that “findings” from the Ways and Means Committee, chaired by Republican Camp, “suggest that Lerner may have violated multiple criminal statutes.” The letter went on to add that “the Committee asks that you pursue this evidence.” The three networks ignored this letter, however, although CBS and ABC talked about Hillary Clinton’s presidential aspirations. It was also reported at Townhall.com that Lois Lerner’s staff had given information on True The Vote to Representative Cummings’ staff. True The Vote is one of the organizations targeted by the IRS. Representative Cummings had denied that charge, but a number of emails have surfaced. Other developments in the letter were ignored by the networks as well. Republicans accused Lerner of talking about taking a job with President Obama’s advocacy group Organizing for Action – while she was investigating non-profit applicants as the IRS head. The IRS is not and should not be a political organization. We have two choices–either put honest people in control of the IRS or abolish the IRS. Otherwise the IRS will simply become a weapon to be used by whichever party is in power against the opposition party. That is not what America is about. Yesterday The Committee on Oversight and Government Reform released its report on Lois Lerner’s role in IRS targeting. Unless we are willing to live in a country where the laws are made and changed at will by whichever political party is in charge, Ms. Lerner has to be held accountable for her behavior. There is enough evidence against her to move forward with legal action. It is time to do that. Unfortunately, her behavior is typical of the Obama Administration’s disregard for the U.S. Constitution and the law. 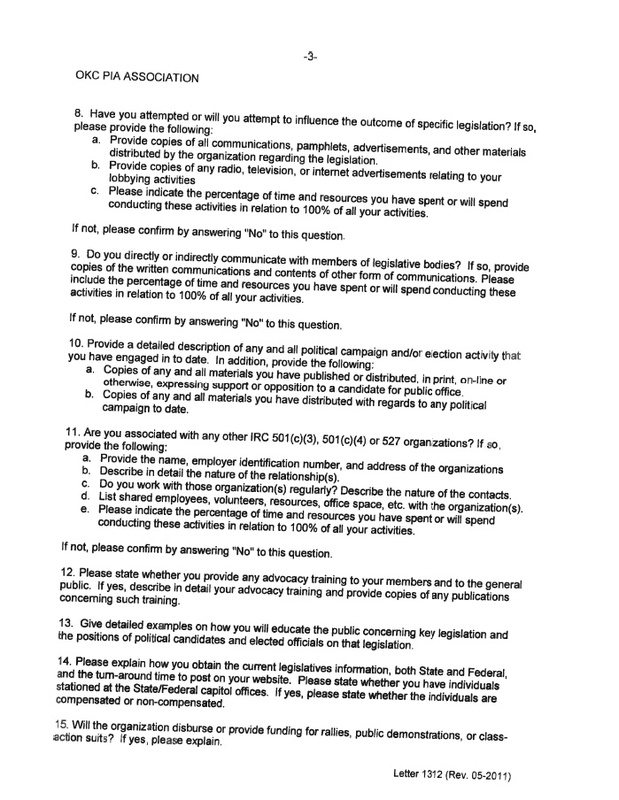 These simple questions – each based on indisputable facts – establish that somebody outside of the IRS told her they wanted the tax agency to “fix” something involving groups seeking 501(c)(4) tax status, that she directed subordinates to begin a (c)(4) project she feared could be seen as “political,” that she viewed Tea Party groups as “dangerous,” and that she ordered that such groups be subjected to “multi-level review.” Those are the four essential points of the IRS scandal: Who ordered the tax agency to get involved, who in the tax agency responded, who they targeted and what actions they took. She cannot answer these questions because, as she herself has claimed, that would be incriminating. Lerner and others must hope Issa doesn’t already have the answers. Obama addressed concerns over Benghazi, the launch of HealthCare.gov and the IRS, during the interview Sunday before the Super Bowl. He adamantly rejected the suggestion that the IRS was used for political purposes by singling out Tea Party groups seeking tax exemption. “That’s not what happened,” he said. Rather, he said, IRS officials were confused about how to implement the law governing those kinds of tax-exempt groups. “There were some bone-headed decisions,” Obama conceded. Yesterday Scott Johnson at Power Line posted a letter from William Henck, a man who has worked inside the IRS Office of the General Counsel as an attorney for over 26 years. I am not going to post the letter as it is very long, but I strongly suggest that you follow the link to Power Line and read the letter. It is chilling. Scott Johnson also posted a story at Power Line today about Cleta Mitchell, who he describes as the most dangerous woman in America. Ms. Mitchell is the Washington attorney who represents several clients victimized by the criminal misconduct of the IRS over the past four years. A video of her testimony before Congress on Thursday is included in the article. She is smart and articulate–she does represent a danger to the Obama Administration. Please watch the video to see why. The IRS scandal is dangerous to America. It means that whichever party is in power in Washington can use the IRS to target its enemies. This is an impeachable offense, and any administration that engages in this behavior should be faced with the threat of impeachment. If She Didn’t Do Anything Wrong, Why Does She Need Immunity? I will readily admit to being a simple person–black is black, white is white, to me life is pretty simple. But sometimes when I see what goes on in our legal system and political system, I just wonder who is making the rules and if anyone making the rules has any common sense. This article is an example of my simplicity coming up against the complexity of our legal system. Yesterday Breitbart.com reported that Lois Lerner has told the House Oversight and Government Reform Committee that she will not testify before them without being granted full immunity. Hmm. If she didn’t do anything wrong, why does she need full immunity? On Tuesday, William W. Taylor III, attorney for Lois Lerner, the IRS official at the center of the Tea Party targeting scandal who invoked her Fifth amendment rights before the House Oversight and Government Reform Committee on May 22, set forward his client’s hard line conditions to return and testify openly before the committee. “They can obtain her testimony tomorrow by doing it the easy way … immunity. That’s the way to resolve all of this,” he told Politico. As I said–I am a simple person. If she didn’t do anything wrong, why does she need immunity?